We’d love your help. 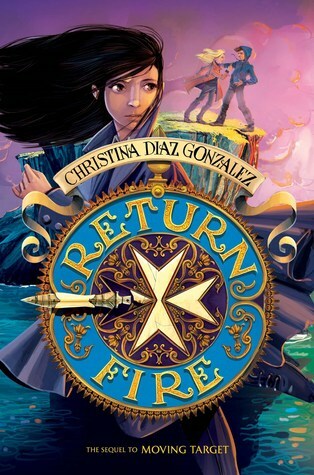 Let us know what’s wrong with this preview of Return Fire by Christina Diaz Gonzalez. The thrilling sequel to Moving Target! When a young girl can determine the destiny of the world, the wrong choice could lead to disaster . . .
Cassie Arroyo has found the long-lost Spear of Destiny -- only to have it stolen right out from under her! In Return Fire, Cassie and Asher must regain the spear. This time, however, it's not enough just to find it: Cassie realizes th The thrilling sequel to Moving Target! When a young girl can determine the destiny of the world, the wrong choice could lead to disaster . . . In Return Fire, Cassie and Asher must regain the spear. This time, however, it's not enough just to find it: Cassie realizes that when she used the spear, she sent the world down a path that could eventually lead to serious trouble. Can she find a way to stop the terrible chain of events that she set into motion? As she tries to reshape her own destiny, Cassie takes off on a breathless adventure across Italy, leading her to a forest outside Rome, a Caravaggio painting full of clues, and a villa by the sea. There, in the ultimate showdown, Cassie has to decide who she can truly trust. And when the chance to use the spear presents itself again, she has to figure out if she can even trust herself. To ask other readers questions about Return Fire, please sign up. How do I read this book on this website? Full disclosure: I'm an adult parent of a nine-year-old who enjoyed the book greatly. He likes it when I read the books he enjoys, so here I am! Like its predecessor, this book is a fast-paced adventure. It's in the same vein as thrillers like those by Dan Brown -- the heroes are being chased by a secret society as they encounter clues and puzzles in their search for a mysterious artifact. However, as this is a YA book, there is a lot less bloodshed and the puzzles are a little less complex. If t Full disclosure: I'm an adult parent of a nine-year-old who enjoyed the book greatly. He likes it when I read the books he enjoys, so here I am! If there was one complaint about the book, it's that some things are a little too simplistic. For instance, at the very beginning, the main character spends a few pages perplexed over the age-old puzzle involving a farmer trying to transport a fox, a chicken, and a bag of seed across a river. I get it -- I'm not the target audience for the book. It's like watching Scooby Doo cartoons as an adult. As a kid, it was all big mystery. As an adult, when they reveal the culprit at the end, you think, "Come on -- it couldn't be more obvious. Even a monkey could have figured it out after 3 minutes." A satisfying sequel, but not as riveting as Moving Target. I wasn't motivated to keep reading until about a third of the way through when the action picked up. Worthy sequel that answers some questions. Almost wish the first book were a stand alone, but think there will be a third book to wrap some things up. Will purchase for fans of first book. This review has been hidden because it contains spoilers. To view it, click here. Zorlu Hedef serisinin ilk kitabı Kader Mızrağını sevmiştim. İkinci kitabın çevrildiğini duymak beni çok sevindirdi ama bulmak kolay olmadı. İstanbul'da neredeyse birkaç D&R'da varmış bu yüzden online sipariş edip beklemek zorunda kaldım. İlk kitap çok güzel bir yerde bitmişti. Arkadaşının ihaneti ile sarsılan kızımız o sırada bir de yıllardır babası sandığı adamın aslında babası olmadığını öğrenmişti. Kader mızrağını ondan almaları da pek hoş olmadı tabi. Serinin iki kitaptan oluşması beni ü Zorlu Hedef serisinin ilk kitabı Kader Mızrağını sevmiştim. İkinci kitabın çevrildiğini duymak beni çok sevindirdi ama bulmak kolay olmadı. İstanbul'da neredeyse birkaç D&R'da varmış bu yüzden online sipariş edip beklemek zorunda kaldım. İlk kitap çok güzel bir yerde bitmişti. Arkadaşının ihaneti ile sarsılan kızımız o sırada bir de yıllardır babası sandığı adamın aslında babası olmadığını öğrenmişti. Kader mızrağını ondan almaları da pek hoş olmadı tabi. Serinin iki kitaptan oluşması beni üzdü. Rick amca gibi bu yazarımızda bir beşli yapabilirdi bence çünkü konu çok müsait. Madam Elisabeth'e güvenemedim hiç diye düşünüyordum hep ve sebepler arıyordum kendi kendime. Belki çok sert biri olduğundan sevmiyordum onu. Çok otoriter ve Cassie'ye de bağırdı falan. Tobias'ın Cassie'nin babası olması bana iyi, ben o kısmı sevdim. Mızrağın etkisinden kurtulan Tobias’ın tatlış biri olduğu gerçeği de beni ikna etti. Der zweite Band der "Moving Target" Reihe schließt direkt an den ersten an und man ist sofort mitten im Geschehen. Auf den ersten Seiten habe ich noch ein bisschen gebraucht mich in die Geschichte reinzufinden und mich an die Geschehnisse aus dem ersten Band zu erinnern, aber das hat nicht allzu lange gedauert. Auch der zweite Teil ist eine gelungene Mischung aus Spannung, Abenteuer und Mythologie. An mancher Stelle kam mir Handlung zwar etwas gestreckt vor, aber insgesamt war das Buch für mich jedoch sehr unterhaltsam. This review has been hidden because it contains spoilers. To view it, click here. I loved it and couldn’t take my mind off of the twists and turns that the books has. It pulls me in, I like the part when Cassie dies and then Tobias sacrificed his life for Cassie’s by going the the Realm of Impossibilities and bringing Cassie and Asher back to life, because Asher was Cassie’s gaurdian so if she died, he died as well. I loved this book as much as I liked the first one. The main characters are just children and they get themselves in so much danger. This book takes you on an adventure through Italy. Make sure to read the first book to the series. It is called "Moving Target." Excellent book for middle grade students to enjoy. Very quick read as it kept you on the edge of your seat! Lots of twists and turns for those who love adventure stories with some legend and magic thrown in. Really good for young readers that are ok with a little violence and love suspense. Loved Moving Target - liked Return Fire. Still worthy of 4 stars (better than average), but it lacked a little of the fire of the first book. Still highly recommending to my middle schoolers!! I loved this book. I think that 6 graders and up would like it also. I love it because she does not back down and she is very determined. Loved the conclusion to the Moving Target story. I was not disappointed and look forward to The Red Umbrella now sitting proudly in my stacks of books to be read! It's a bit difficult to read. So far there hasn't been much action, just yelling. There was one point of action, but not much else. Slowly losing interest in the book. It's rare that the second book in a series is as good as the first. Mrs. Gonzalez has improved since her first book; it's easier to visualize her writing. The emotions are still strong and bright, the action is still clear and believable. I love the fact that the single person in the world the heroine trusts most (besides her not-on-the-scene father) is the boy who is her guardian -- and although he is a patient, brave, smart, dependable type whom she cares deeply about she isn't buried in a mor It's rare that the second book in a series is as good as the first. I love the fact that the single person in the world the heroine trusts most (besides her not-on-the-scene father) is the boy who is her guardian -- and although he is a patient, brave, smart, dependable type whom she cares deeply about she isn't buried in a morass of sexual hormones every time she looks at him. And so we get lots about Asher being brave, Asher struggling with the presence of a suspected traitor, Asher talking things through with careful reasoning....and nothing about pretty eyes or silky hair. As a result, I actually respect Asher. Even better, the heroine thinks of him as 'Asher, great human being and close friend that he is' as opposed to 'the hunk'...as so many other teen adventures would do. Do I suspect that these two will probably end up together someday? Yes. They have proven that they can work together very well indeed; they trust, respect, and care for each other. Are they too occupied with saving the world right now to even think about that? Heck, yeah. The story went to good places, too. It didn't feel rushed or burdened with the stressed need to make every scene more high-octane than the last. It didn't have to, because as our teenage protagonists learned more about the issues at stake their choices took on more and more weight. Mrs. Gonzales even avoided the typical "this is an item of power that corrupts everyone who touches it, but YOU are totally okay, young kid, because you are a special snowflake and we think you're a decent guy" trope. The consequences were real, and they were serious. It gave a gravitas and poignancy to the entire plot. And the ending was very good, with a nice point to it. In the end it is a book about second chances, and the importance of fallible humans exercising moral agency. 3.5 stars. This one didn't grab me as much as the original, but sometimes that's the fate of sequels. Still enjoyed the continuation of Cassie's story and looking forward to sharing this with my students. In this sequel to Moving Target, Cassie is searching for the Spear of Destiny that she bonded with and then had stolen from her. She and Asher are following a series of clues across Italy again, never knowing who they can trust or who might betray them. An excellent continuation of their adventure. I highly recommend reading Moving Target first. For grades 4 & up. I absolutely love this book. It is just as good as the first book. It is heartbreaking that there isn't going to be another sequel. This is most definitely one of my favorite books. I would give it and even higher rating if I could. I most definitely recommend this book to anyone. I didn't read the first book but I had no problem jumping right into the story. I think kids would really like this book. It's fast paced and has lots of surprises. As an adult it was a little young for me. Excellent second book!! It wrapped up nicely but I'd still love to hang out with these characters again! Kind of a DaVinci Code for kids...fast paced mystery with tons of action. You have to read the first to understand this one though. Christina grew up in a small Southern town in the Florida panhandle, but she's always been in touch with her Cuban heritage. She loves having breakfast with pan cubano and Southern style grits-- the best of both worlds! She is the author of the award-winning novels, The Red Umbrella, A Thunderous Whisper, and the action-adventure duology, MOVING TARGET and RETURN FIRE (Scholastic).